The fermentation of set yogurt takes place in the retail container, although the biochemical reactions responsible for the formation of the coagulum are exactly the same as in stirred yogurt. The yogurt is poured into containers then incubated without any further stirring. Set yogurt has a characteristic thick texture which makes it ideal for a number of uses such as within curries or sauces or quite simply on its own. 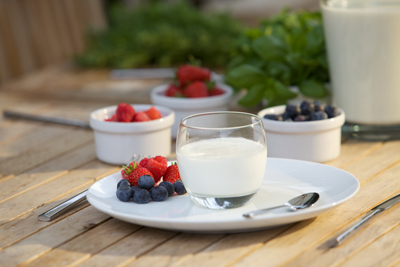 Set yogurt provides the body and firmness of Greek yogurt, but with less fat content. Our KaTech technicians are experienced in developing new products to your specification and can be on-hand to assist with the new product process and scale-up in your factory to ensure your requirements are fully met. Contact us today to start the new product process. Common defects found in yogurt include low viscosity, air bubbles, textural defects (eg sandy or long), synerisis and taste issues. Movement of set yogurt after incubation should be kept to a minimum until chilled, as the gel is weak and susceptable to fracture. Also too low a pH can lead to defects such as shrinkage and synerisis. We are experts in yogurt technology. Call us …….. we can help! KaTech can help yogurt manufacturers to keep costs down and product quality high. Our approach to cost optimisation is to use our pilot plant facilities and expertise in functional ingredients, to design a product that meets your cost brief, within your existing processing capabilities. There are significant opportunities for recipe cost saving on set yogurt were the product does not need to be marketed as ‘natural’. We have vegetarian gelling systems specifically designed to replace milk solids in set yogurt, whilst maintaining the typical firm, gel-like consistency you expect.